On the morning of 10 April 1940, 110 people on board HMS Hunter died when the Royal Navy ship was sunk by German forces during World War II's first Battle of Narvik, in Norway. 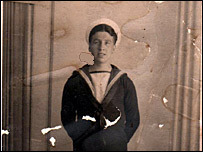 John Hague, now 87, but then a 19-year-old able seaman, was one of just 35 survivors. "It was early morning, around four-thirty or five o'clock and I was down, below deck, in the ammunition room feeding munitions from the shell room to the gun room," he said. He and the other men on duty felt "a jolt" and realised HMS Hunter had been hit, but they did not know the extent of that damage. He recalled there was no evacuation siren, no orders to abandon ship. Climbing the steps to the outside world, the men were struck by the chilling winds of the blizzard and an eerie absence of people. "The first we knew it was bad was when we started to tilt, we went up to the deck and saw that there was no-one around - those that could leave had gone," said Mr Hague. When asked what it was like, he retorted: "What's it like being in a freezer? It was very icy and the blizzard was blowing and we knew we had no choice but to get off the ship. "I don't know how long I was in the water, I tried not to think about the cold and I tried to keep moving to keep warm and to stay afloat," he said. As the men trod water, a ship appeared and a rope ladder was thrown over its side. 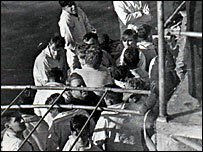 Shivering and drenched in a mix of seawater and oil, the men scaled the ladder and clambered aboard the vessel. "As soon as we got on board, they scrubbed the oil off us and gave us what clothes they could find for us to wear," Mr Hague said. "They [the Germans] were alright and I didn't have time to be frightened, it was all happening so quickly." They were taken to Narvik and transferred to a German ship where they signed an agreement promising that when they returned to Britain they would not fight the Germans. "We had to sign a declaration saying we wouldn't take up arms against them. "That really upset me because of course I wanted to go back." 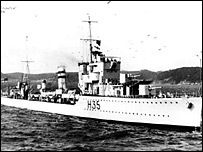 Mr Hague and the other HMS Hunter prisoners spent two days in the hands of the Germans before they were handed over to the Swedish authorities and interned. He spent his time making bricks and learning the odd Swedish word, he said. In December 1941 his chance to go home came when he volunteered to be part of a skeleton crew on a decoy ship which sailing from Sweden to Scotland. "It was a moonless night in December, we got the signal to move and we left." In December 1944 Able Seaman Hague was awarded a British Empire Medal for his role aboard the decoy ship. Unable to return to the navy - because of his declaration not to fight the Germans - he joined Ford where he worked as an engineer checking aeroplane engines. "It's great that they've found the Hunter and now we know where they are, my fellow shipmates have a resting place." As wreaths are laid at the spot where HMS Hunter was discovered, Mr Hague will reflect on the events of April 1940. "I'm sorry I can't be there, but I'll have a quiet moment with my family to remember," he said.